By Luke Toomey | March 5, 2017. On paper, you would not expect a sequel to an ultra-violent, Keanu Reeves action movie to be one of the better films of 2017, but the events of the last year have shown us anything can happen. Picking up shortly after the end of the movie’s 2014 predecessor, professional assassin John Wick is reluctantly propelled out of retirement to repay a debt in the form of a blood oath with Italian gangster Santino D’Antonio (Riccardo Scamarcio). The plot takes a back seat to the impressively stylised choreography of the shoot-outs, fist fights, and dances with close range weapons – including a nod to the gruesome rumour about Wick killing three men at a bar with a pencil (not for the squeamish) – and rightly so. This film is self-aware of its role as a medium of fetishized violence and doesn’t try to add anything more to the story than it needs. Focused performances from the cast and artfully executed cinematic arrangements of camera shots complement each other beautifully, especially the fantastic subway scene between Wick and Cassian, played by hip-hop artist Common, where they hilariously exchange discreet potshots while trying to remain unnoticed by the public. 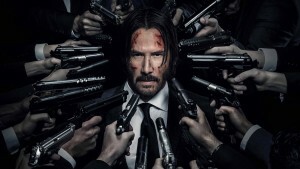 Lighter moments such as these, alongside Chad Stahelski’s directing ambition, are some of the best in the movie, with each gag and punchline lifting the plot out of the trap of being a cliché balls-to-the-wall, guns blazing action flick, and raises the bar for what will predictably become a blockbuster franchise. John Wick: Chapter 2 landed in Irish cinemas on 17th February.